I’ve got a good excuse though, I’m in bed and posting up a quick blog as I’ve not been too well… (arrrhhh I hear you say.) Thanks. Despite wrestling with a right pain in my behind (also known as Sciatica) I have been refreshed thus far with still one more session from Simon Ponsoby to go I know I’m in for more of the same tonic of vibrant authentic sung worship and open hearted teaching; despite Simon saying over dinner he wasn’t sure what he was going to speak on in the morning. If it’s anything like people said of his morning’s ‘off the cuff’ teaching then I’m in for a treat. So, what’s been refreshing for me while I’ve been here? Top of the list is the presence of God. It is so good to be ministered to. I sat at the front of the main hall being prayed for by one of the ministry team (a complete stranger) who shared some words that God had given him for me. I simply wept as I felt that unmistakable tangible presence of my heavenly Father loving me and reassuring me. Earlier on in the day I sat with one of the regional team leaders of the Baptist Union who shared two words that God had given him for me. What an encouragement to me. We have also been treated by a musical assemble called Epiphany, a group who play prophetic worship with violins, flute, cello, piano and percussion and ‘play over people.’ May sound slightly freaky, but my goodness I loved it! I sat in a room for an hour and a half with music and prayer and it felt like 20 minutes had passed. I also have felt refreshed through meeting with my Baptist brothers and sisters. Over meals, in the bar, planning mission week-ends or talking through the Presidential year and The Big Hearted Tour, it has been so good to be with my baptist family. I came along to this conference with my Pastor Phil Campion and church leaders Bill and Carol Swale from Biggleswade Baptist church. They have refreshed me so much by looking after me and helping me with my sore back. 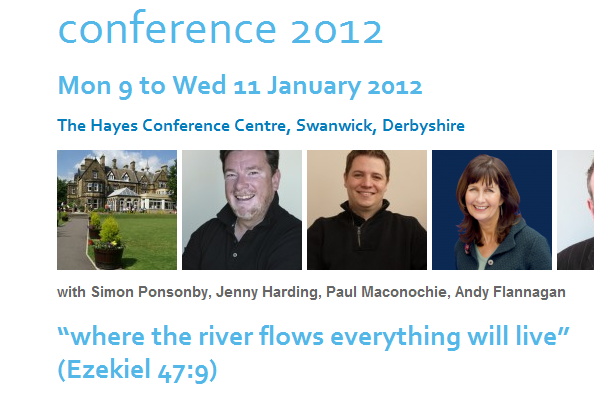 Next year I have the privilege of speaking at the Fresh Streams conference. Click HERE the link. Glad you were blessed! I might have to attend next year and check out that excellent speaker ….